An academic and research fellow with a focus on ageing and cognitive decline has been awarded for her work with the annual Professor Robert Helme Research Award through the National Ageing Research Institute (NARI). Dr Anita Goh was awarded the 2018 commendation for her “outstanding research” across a number of fields, including her work with Anita Panayiotou in developing and successfully delivering a new half-day training program about assessment and management of cognitive decline - Thinking about Thinking. Associate Professor Briony Dow, Director, NARI commends Dr Goh for her work and the award. “Anita is relatively new to NARI, having commenced just over a year ago,” she says. “However, she has been a collaborator and colleague for many years before that. “This year she is the worthy recipient of the Rob Helme award for outstanding research. 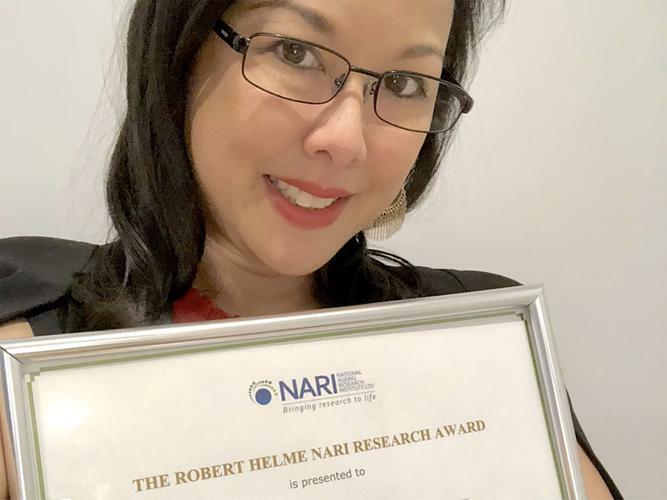 NARI even took to Twitter to support the award recipient: “Congratulations Dr Anita Goh for receiving the Robert Helme Award for her research and contribution to NARI”. She says she is “very proud” to be recognised for her 10 years of dedicated work - especially her work over the past 12 months in managing a large government funded project focused on improving outcomes for people with dementia and their paid and family carers. “I am very dedicated to my work in enhancing health and well-being in older people and those living with and impacted by dementia and mental illness, and I am glad this type of work is recognised,” she says. “I think this is an important area to focus on as we need a future-friendly environment for the dementia community, particularly as the numbers of those diagnosed with dementia will increase a lot in the coming years. “As a clinical neuropsychologist, my work is informed by real life issues, and my research focuses on cognitive health, mental health, and quality of life in ageing, with a specialisation in dementia care - from preclinical to end of life care. “Through my work, I want to make the impact of living with dementia less stressful and confusing for patients and for their family. This is not the first time Dr Goh has been acknowledged for her work and research in the field of ageing and cognitive decline - acknowledging her diverse knowledge and experience in cognitive assessment, neuroimaging, dementia prevention, healthy ageing, mental health, using technology to improve dementia care, and social issues such as discrimination. It has been a big week for NARI researchers, with NARI Director Social Gerontology Bianca Brijnath also being announced as the winner of a Tall Poppy award for her research which focuses on reducing barriers to timely diagnosis of depression and dementia in older Australian migrants.